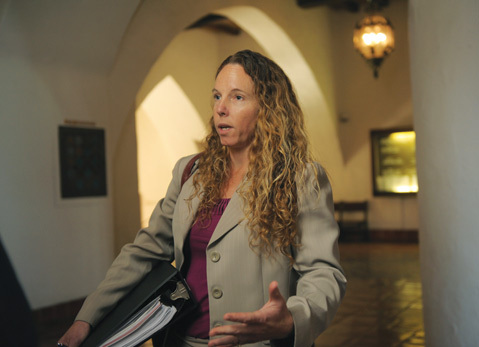 <b>NO DOUGH: </b> Tara Haaland-Ford worked 400 hours to defeat the gang injunction but Judge Colleen Sterne ruled she’s not entitled to attorneys’ fees. Sterne acknowledged the existence of criminal street gangs, but she ruled that their conduct constitutes a public nuisance that could not be adequately remedied via traditional law-enforcement methods. Initially, the prosecution named 30 alleged gang members in the proposed injunction. By the time trial started this spring, that number had been reduced to 11. Of those 11, one was ruled not to be an active gang member any longer. Attorney William Makler sought to persuade Sterne that the multiple constitutional rights ​— ​travel, expression, and assembly ​— ​that would have been abridged by anyone named over the life of the injunction, plus their families, benefited. Given that law enforcement acknowledged the injunction would be used on other known gang members, Makler argued this number was far greater than 11 or 30 and could easily have exceeded 100. Had he, Tara Haaland-Ford, Steve Dunkle, James Crowder, and Neil Levinson not intervened and worked on behalf of clients without the resources to otherwise afford attorneys, Makler argued, the injunction would have not been opposed.